How a Jury Trial Works | Swope, Rodante P.A. We have seen and heard numerous stories about the problems with our modern jury system. It is getting hard to go a day without seeing a story in the news about a lawsuit, a possible insurance crisis, or the most recent notable star to get in trouble with the law. that right to trial by jury in the 7th Amendment, stating that in suits where the value in controversy shall exceed twenty dollars, the right of trial by jury shall be preserved. We believe that despite the challenges we face together as we adjust to the modernization of the court room, the leap in available technological resources, and the increasing costs imposed by such advances, the jury system works! As modern consumers, we see evidence of juries’ success all around us. The nationwide decrease in the severity of products liability cases demonstrates the jury system at work. Many large companies are now looking to avoid the high costs of litigation and public humiliation. Without the jury system, there is no incentive for companies to add things like safety guards to power saws, or to inspect their products for dangerous ingredients. Instead, more and more companies are inspired to spend money on improving the products they produce and the safety measures taken in their production. Let’s not forget that when we drive down the road in our safer cars, with gas tanks that do not explode in a minor crash, and see new traffic lights replacing stop signs, when we see safety fence installations on curved roads, and even when we drink coffee that is not hot enough to permanently scar our bodies, we have a thoughtful jury to thank for protecting us. Not only do we at the firm have the opportunity to see these everyday examples, but also we have the privilege to see successes such as these in the eyes of our former clients. Compelling examples can be found in almost every area of the law, and many more tangible demonstrations touch everyone’s daily experience of life. The founders of this country had the foresight to allow the group conscience to act with consequence. We see the fruit of that wisdom everyday! The juror plays a profoundly necessary role in our legal system. There are actually two different types of juries: grand juries and petit juries. A grand jury decides whether or not the State has enough evidence to indict an individual for a crime. A petit jury is used in a civil trial, and gets to hear and weigh evidence, and return a verdict for either the Plaintiff or the Defendant. The jury system is one of the checks and balances which keeps the whole system of government running. We count on legislators to propose and pass laws, but without juries, the interpretation of laws would be mainly in the hands of judges. Juries ensure that the common person has a say in how justice is brought. 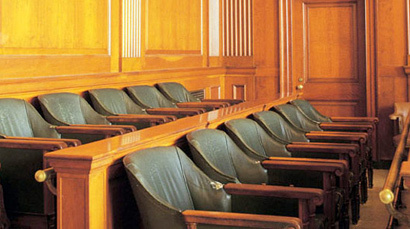 A judge does have certain legal knowledge and training that the normal jury member lacks, therefore, during a trial, the judge acts as a guide. The judge may direct the jury to pay special attention to certain evidence, require answers to certain questions, and even to find in a defendant’s favor. However, the jury will sometimes return a verdict contrary to the judge’s direction. In this way, juries act as a check and balance inside the judiciary. The importance of the jury system is never more clearly demonstrated than it is now as the system itself is being tested. We see that the very people who benefit the most from the jury system are turning sharply against a system they fail to understand. In the media, we see the jury system called into question. Insurance companies and other big businesses take every opportunity to minimize the possibility that a jury will have the prospect to hear a case. These same companies and businesses use their power to lobby the government to enact laws to limit the types of cases that a jury can hear. Instead of strengthening and expanding the jury system, we find ourselves increasingly put into positions where in order to purchase or participate, or to sign a contract, or to see a doctor, we have no other option than to agree to a contractual position requiring arbitration or that waives our ability to bring suit entirely. Similarly, many large companies and business interests have a desire to poison the public’s view of a jury trial. Stories in the press about tainted jury members and accusations of incompetence in the judiciary not only act to feed a national feeling of insecurity in the legal system, but also to distract us from stories about the atrocities civil trial lawyers combat daily. The more special interests, big business, and insurance companies’ manipulate us with non-negotiable contracts forcing us to waive our right to a trial, the more important it is to remind ourselves just what it is that the jury system means to our country and to protect it at all costs.